Ultima VII: By jove, it’s Cove! I felt bad about leaving Weston behind to joy ride on my new magic carpet, so I flew back to the castle and smacked Lord British around until he saw the error of his ways. Smacked him with words and truth, I mean to say. Man, this guy is the most oblivious fantasy ruler I’ve ever met. Time to put to work all of the new gear I’ve been getting! We head out of town and do a little robber patrol. It’s an insanely fast fight, as they give us no trouble at all. And it nets me a new boomerang, because why wouldn’t an Australian weapon be in a fantasy version of medieval Britain? We hop on the carpet and head east for the quaint burg of Cove. When we get there one of my companions starts freaking out because, hey look, there’s the Compassion shrine. To me, it’s a “please loot this spiffy ring that’s sitting out in the open air” shrine, but whatever gets you excited, man. I’m surprised to find another old companion? 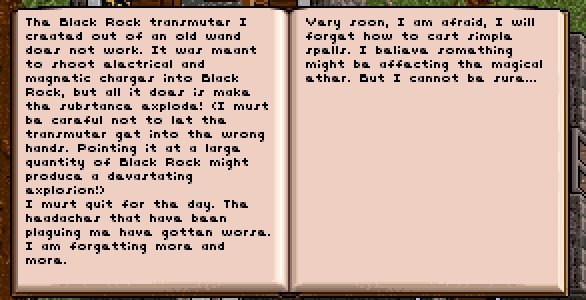 No, Ultima VII; at this point I’d be surprised if I walked into a town and didn’t stumble over some former companion. According to the latest census, “previous Syp companions” makes up 72% of the population of this continent. Anyway, Jaana joins my merry band of food munchers, and off we go! So let me get this straight. Britain is the city of Compassion. Cove has the shrine of Compassion, but is the city of Passion. Why… don’t you swap shrines, or something? Cove is very small, so it’s not long before I’m knocking on the door of the mage Rudyom. In a fit of irony, he mentions that adventurers had borrowed his big blue magic carpet a few weeks ago. The carpet that I just found. I do not think I will tell him that I am using it. At least not for now. Like the other mage that was in Lord British’s castle, Rudyom’s mind seems to be going. He can’t remember much and can’t do spells at all. He did indicate that he was working with “blackrock” to help combat the declining magic and created a special wand to work with it. However, the wand just blows up the rock and there are just fragments and garbage all over the house. I take the fragments and wand, and call it a day. As games approach, so do the rapidly gelling opinions of those looking at them, both in the pro and con camp (what, wait until a game is released to form an opinion? What madness is this of which you speak?). A lot of confirmation bias goes on — if you are inclined to like a game, you’re going to look for aspects that back that up, and if you don’t like it, you’re going to root out evidence that proves your viewpoint. We all do this. I’m inclined to like WildStar for many reasons, including having actually played a nice bit of it, but if you can’t acknowledge both the ups and downs then it’s going to be harder in the long run as a fan of the game. So here’s the big question-slash-attack that I’ve seen levied at WildStar quite often — and I only expect it to be mentioned more once the release date comes out and we ramp up for launch. I’m not a fan of this question, not because I don’t think that there’s merit in it (as we’ll examine in a second) but because most people asking it or stating it aren’t looking for an answer, they’re just spitting out a good-sounding quip that allows them to be as dismissive as possible using an economy of words. Compare game A to game B while the context takes the job of insulting it (as in “Anything World of Warcraft-like is derivative and undesirable and unoriginal,” which is what is really being implied), and there you go. You’ve delivered a crushing blow to its fans! So amazing. Even so, it’s a topic that needs to be addressed because, like it or not, WildStar is going to get those comparisons. The biggest reason is that it bears more than a striking resemblance to WoW’s well-known look: WildStar has a very colorful palette and cartoonish, stylized art. I think that WS is perhaps even more stylized and colorful than WoW, but it’s a fair observation. Pressing the point of similarities, WildStar is a theme park MMO with many familiar elements that, yes, World of Warcraft has as well: leveling, dungeons, raids, talents, PvP, quest hubs, achievements, and a transition between a leveling game and the “elder” game. Sometimes people ask that question because the comparison to WoW is very unfavorable due to burnout — they’ve been there, they’ve done that, and they don’t want to do it again “just in space.” I think it’s important to note two additional factors, however: Carbine hasn’t made any direct comparisons or claims to WoW, and that for others, similarities to WoW might be very desirable. For example, ever since seeing the first WildStar screenshots, I was in love with the visual world. I love bright colors and stylized designs — much the way I was initially attracted to WoW when I first saw it in 2003. It’s a matter of personal taste, and so here it’s a plus for me, not a minus. As for theme park elements, well, again it depends on what you like. I’m not against sandbox design by any means, but I vastly prefer theme park MMOs. They’re comfortable, fun, and enjoyable to me. That WildStar is about 80% familiar design with 20% different ideas is a good mix (asking for 100% new is something players love to do but is completely unfeasible). So there are three ways that you can make something really entertaining, in my opinion. The first is to come up with a new idea. The second is to combine two previous ideas to form a hybrid that functions as a new idea or to give a new take on an old idea. And the third is to take an old idea but do it very, very well. This goes for books, games, movies, etc., and as long as the end product is engaging, then I am not picky. There are very boring ways to charge players with quests and really exciting ones, and a world of difference can lie between them — even though they’re both quests doing more or less the same thing. One thing that WoW did teach us is the lesson of “polish” — taking a working idea but making it elegant, attractive, and far more user-friendly is a huge boon for a game and gets a lot more respect from players. This is what I feel WildStar is doing. Is that wrong? 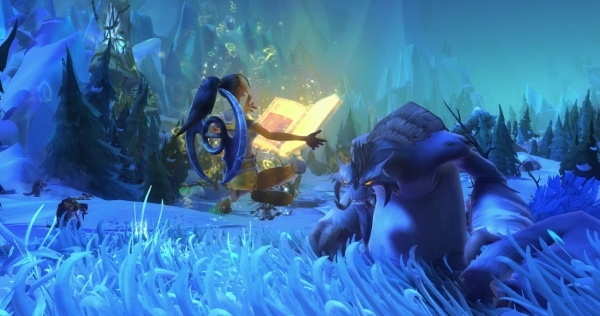 Should WildStar have been trying very hard to divorce itself from any hint of WoW-ness? I honestly can’t make that call. We’ve seen games similar to WoW do well and ones do poorly. We’ve seen MMOs that try hard to differentiate themselves from WoW fare both good and bad. It could indeed push potential players away, but it could also attrack new ones (and even ones tired of WoW but not looking to make a huge change). Maybe it’s even time we get past constantly comparing games to other games as equally or more important as examining the game on its own merit. Easier said than done, of course. For me, no, WildStar is not “just” WoW in space. It has similarities, but it’s also shaping up to be more. The other thing that irritates me about that question is that it’s very dismissive of anything that WS is doing different from WoW, which there is. The path system isn’t just a frill, it’s a genuine sub-class that offers a lot of replayability and interesting combinations. WS’ “limited action set” is more like GW2/RIFT in space than WoW. Its housing system is really stunning and is not what WoW is looking to do with garrisons in any case. Then there are adventures, challenges, shiphand missions, mount customization, PvP customized bases, hoverboards, and an attitude from the game and devs that feels far more fresh to me that what I’ve experienced from Blizzard. Ths isn’t even to mention the unique world setting with its own races, lore, culture, and backstory. Now, is it doing *enough* for those that don’t like WoW to be happy? Probably not. And maybe, just maybe, the “in space” part of that question matters too. We moan about fantasy taking over the genre but are so quick to dismiss a scifi alternative when it comes? Not I. Scifi > fantasy any day of the week for me. My advice is to check the game out to see for yourself without buying into the “just” comparisons. I’ve seen people who weren’t on board fall in love with it, and I’ve seen people grow lukewarm or cold to it who were originally nuts about it. I hadn’t heard this before, so I’m passing it along. Apparently once you hit the level cap in WildStar, instead of earning XP you earn a new type of currency to spend on vendors that sell only to level capped players. Sounds good to me — I hate it when XP goes to waste, and it would be a good motivator to keep doing missions, etc. Some days there’s nothing to talk about and some days there’s way too much. So let’s cover a lot of ground in one post here! It looks as though things are settling down at Turbine following the layoffs and reorganization. Asheron’s Call is being put into maintenance mode (with benefits) and LOTRO and DDO have received new executive producers, replacing the Paizes. We got a producer’s letter from Aaron Campbell, which might be a sign of increased communication going forward (which would be very, very welcome). It didn’t address the layoffs, but it did talk about what’s coming in the near and far future, offering some reassurance that LOTRO isn’t being put out to pasture as well. He mentioned the North Downs revamp, a Fangorn Forest quest line that will net us “a special friend,” another epic book to finish the Helm’s Deep storyline, mail with multiple attachments, mail that VIPers can open in the wild, and the return of Hobnangians, which is basically soccer with chickens instead of balls. That letter was just a big pick-me-up yesterday and it definitely made me want to log into the game for a nice-sized play session. I went on my Captain and resolved to make some headway into the big battles portion of the epic storyline. On the plus side, the Hornburg is absolutely incredible — it’s just huge with so much detail and so many things to see, and appropriately fits the status that the books demand of it. On the minus side, I really didn’t enjoy my first big battle. Thematically it was fine, but practically it felt like a skirmish that wasn’t netting me XP per kill and where my actions didn’t really matter that much. Plus it was long, so long that I started to wonder when it would end. Oh well, I guess that after four more of these I won’t be forced to do any more. The WildStar Wednesday yesterday was devoted to talking about the UI revamp. I didn’t exactly hate the old “pyramid” design, but it was very busy and forced me to pull back the camera to see my entire character. The revised UI is really attractive, keeping most of the elements to the bottom of the screen and spreading them out. It looks appropriately techy, but perhaps the aspect that got me the most excited was the option to toggle UI elements so that they can automatically disappear when one is not in combat. It’s a simple thing, but I am definitely looking forward to using it. It’ll be really nice for screenshots, that’s for certain. It was a huge release night for the Apple app store. I was looking forward to the casual and silly Disco Zoo release, but Out There also launched. I picked up both and have only had time to build up my zoo. I know nobody cares, but I have three unicorns and no way to starve them. When will the world create a realistic zoo simulator that involves unicorn deprivation? I’m looking forward to FTL-ish outer space adventures with Out There tonight, however.